July 2015 Aquarius Monthly Horoscope predicts that career will take a significant turn in your life slowly over domestic and spiritual affairs. Home and matters of the heart will have become stable by now, allowing you to concentrate on your professional goals. In July 2015, social skills and the Aquarian charm will work better than independence and rigidity of ideas. Aquarians, you need the help of other people to attain your goals. So learn to be compatible with others. If you are working and not making sufficient progress, this month you can make a change and it will be beneficial for you in your job. Organizations will undergo major transformations for the better. 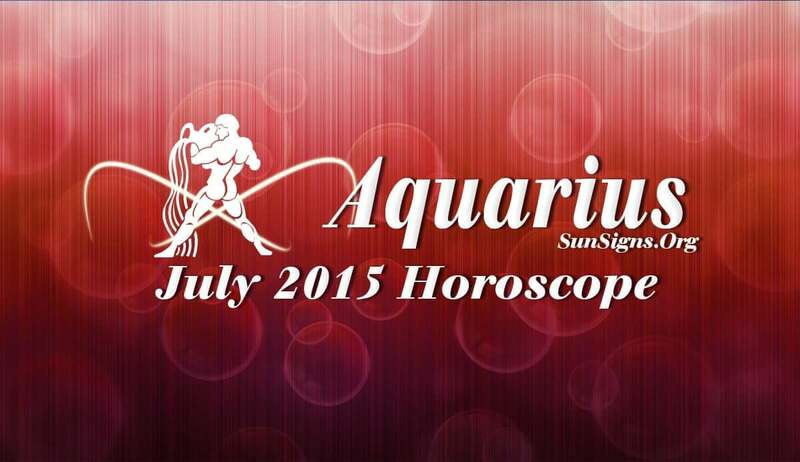 Business ventures will be profitable for the Aquarius zodiac sign in July 2015. The Aquarius financial astrology predictions for July 2015 foretell that planetary configurations are not auspicious for financial matters this month. It is better to work out your monetary strategies, and execute them later. You can review the present projects and make necessary changes. Progress will be slow when it comes to money and earnings. But you should not give up. Love requires commitment from the Water Bearers this month. Singles will find reliable and true soul mates. If you are in a confirmed relationship, you will tie the knot. This is also a good month to plan for a child. The July 2015 Aquarius horoscope forecasts, that health will be normal if you do not overindulge in rich food and strain yourself. Enough rest will keep you going. You might have some problems from sinus related infections.